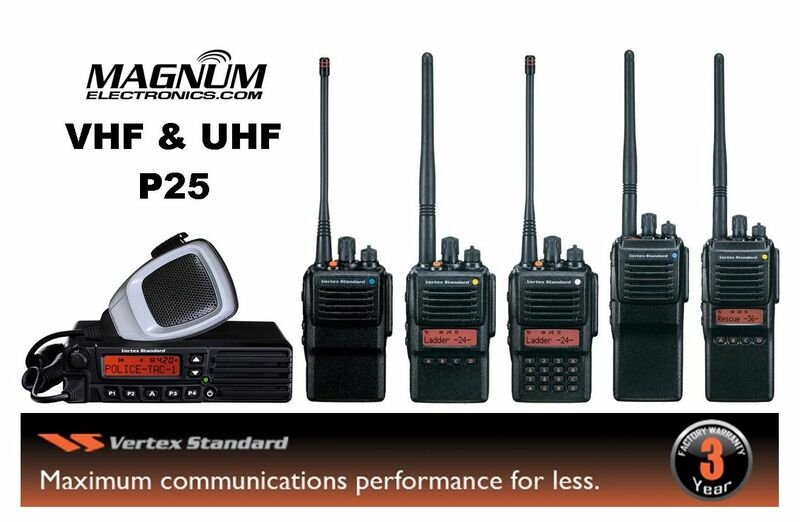 Lower Cost VHF or UHF 2-Way P25 Radios with AES Encryption | Magnum Electronics, Inc.
Vertex Standard manufactures a lower cost P25 compatible communications platform for VHF and UHF conventional users. If your agency or department requires P25 interoperability, the VX-820/920 series is a good choice. Their product offering is not available in the 700/800 MHz frequency band and there is no P25 trunking functionality. The Vertex VX-P820 series is the smallest, IP57 submersible P25 radio available. It can be ordered with or without a display and with a full keypad if needed. The VX-920 series is taller and can accommodate a larger battery and/or optional second receiver. The VX-7200 50 watt, P25 mobile can be ordered as a base or control station if you use conventional repeaters. All models include the Vertex Standard 3 year depot repair warranty. Vertex Standard P25 radios can be programmed in analog or digital P25 mode. Analog features include ARTS, lone worker, and DTMF signalling. P25 digital features include emergency, individual & talk group ID, and mixed mode. AES/DES encryption is available as an option. This entry was posted in Portable Radios, Vertex-Standard and tagged 2-way radio, communications, P25, Vertex-Standard, VX-7200, VX-P820 by magnumelectronics. Bookmark the permalink.